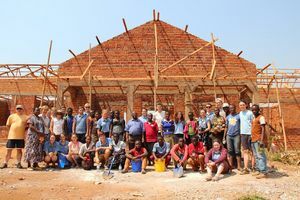 The initial partnership between All Saints’ Academy and Kasulu, Tanzania, began in 2014, when 16 students and 5 members of staff visited area, and helped to build a new secondary school. 16 students from local schools were also selected and the 32 from both countries worked together in friendship to create bonds centred on faith, different experiences and fun. In the time leading up to this mission trip, all members of the All Saints’ Academy community were involved in planning and promoting fundraising activities in order to allow the first group of ambassadors to travel. We now believe that the time is right for a return visit. The 2 week mission trip is designed to cement a global partnership between All Saints' Academy and the Diocese of Western Tanzania. Students will act as ambassadors for the UK and the Church, running a leadership academy designed to improve and develop students' prospects, both here in the UK and in Tanzania. The aim of the project is for students to visit rural Tanzania to take part in a cultural exchange. Students will visit both schools and churches and work extensively with a group of Tanzanian students, with the aim of improving leadership qualities in all students. Both staff and students will be leading church services and school assemblies, celebrating the Christian faith as a global community. Numerous donations of clothing and sports equipment will also be made, enabling the Tanzanian students to continue the mission aims after our return, thus leaving a lasting legacy.